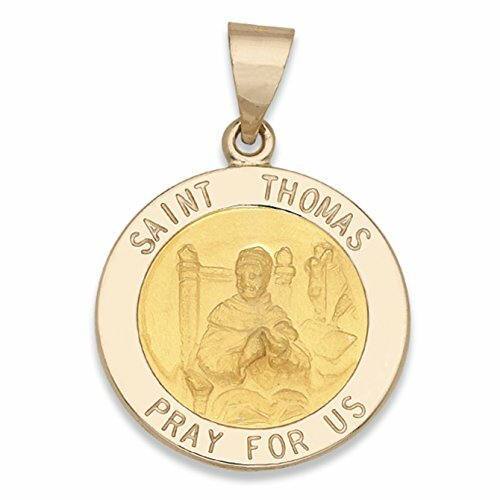 This beautifully designed genuine 14K semi-solid yellow gold medallion is carefully handcrafted and finished to perfection.Saint Thomas Aquinas was regarded as the most influential Western medieval legal scholar of his time.He is considered the Catholic Church's greatest theologian and philosopher. Saint Thomas Aquinas is the Patron Saint of scholars and universities.Size Guide:Please pay close attention to the size guideline provided below to item group. Please be advised that all sizing has been verified for accuracy.All measurements provided are in inches and mili-meters. For your convenience, we have also included a picture of a US quarter dollar as a size reference. Quality Assurance:Every piece of jewelry you purchase from ITI Precious Findings passes the rigorous inspection of our Quality Assurance Department for Precious Metal Properties and Excellence of Craftsmanship.We offer our valued customers 100% satisfaction.If you need any assistance before or after purchasing an item from our store, please contact us directly via email or call our live customer support center at 212-869-1407 (M-F) (9am-5pm, EST).Payment: Orders will be processed once payment is cleared.Direct checkouts and paypal express checkouts are usually cleared instantly.Paypal e-check usually takes 14-21 days to clear and orders can not be completed until it is cleared. Unfortunately any other form of payments are not accepted at this moment.We collect 8.875% tax on all NY orders. Shipping:If payment is received by 4PM EST, your order will be shipped out on the same business day.Any orders received after 4PM, over the weekend or during holidays will be processed on following business day.All our orders are shipped with tracking confirmation.We do not ship to PO Boxes. Refunds and Exchanges:We offer 100% satisfaction guarantee and 14 days return policy.If you are not happy with your purchase please contact us directly before contacting Amazon or before leaving us any feedback. Thank you.